I’m ashamed to say, that until Charlie Pierce in his own, powerful essay on MLK day pointed me to it, I had never actually read Lyndon B. Johnson’s speech to Congress urging — almost ordering — the legislators before him to pass the Voting Rights Act. As a man whose roots go deeply into Southern soil I know how agonizing racial feelings are. I know how difficult it is to reshape the attitudes and the structure of our society. One last thought: One strand I draw from Johnson’s speech is that it is possible to have a politics that transcends the mere purchase and sale of interest; one in which words have both power and integrity. I want that politics back. 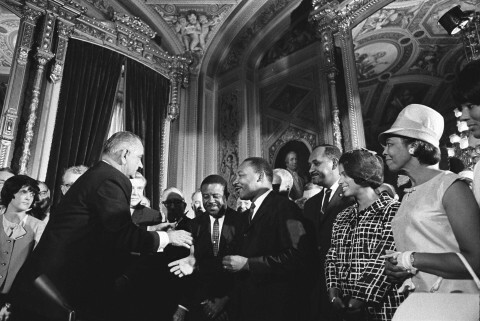 Image: Lyndon Baines Johnson with Martin Luther King on August 6, 1965, at the signing of the Voting Rights Act. This is truly off theme for this blog — but reading Ta-Nehisi Coates yesterday I came across this post on his (and my) most remembered Martin Luther King speech. The post resonated later in the evening as, I listened to Tavis Smiley’s show on NPR and heard one his guests argue that Obama’s nomination acceptance on the anniversary of the “I have a dream” speech did not sufficiently emphasize the Blackness of the Civil Rights struggle and of King’s message. Smiley and several of his other guests disagreed, but the comment made me go back and listen again — second time in a day — to the clip Ta-Nehisi posted, the key passage in the “I’ve been to the mountaintop” speech delivered the day before he was assassinated. Listening and watching again — especially with the foreknowledge that MLK seemed to have of what was coming so unbelievably soon — crystallized why I thought Obama got his note just right in his acceptance speech. He spoke of King not by name, remember, but as the Preacher from Georgia. The Preacher — someone who teaches, persuades, one whose success is judged by what his or her words inspire their listeners to do. The rhetorical idea was obvious, and I think right: Obama was saying that King’s words belong not just to one man, time, and struggle, but form a teaching that transcends those particulars. And in that context, the Mountaintop speech is as important, maybe more so, than the visionary and uplifting Dream. Remember, King really was a preacher, steeped in Bible. He knew exactly what he wanted to do with the image of the mountaintop. His predecessor there was Moses — not like Jesus a messiah, divine and already at least in one attribute an inhabitant of the world to come, but a prophet, a teacher, a mortal man with great flaws to accompany his strengths, who had done his best by his stubborn and stiffnecked people. Moses had led that people for a long time; at the threshold of success, of labor’s end, he learns he will not complete the journey. Most of the book of Deuteronomy is devoted to Moses giving the last lessons he can to his people, uplift and threats, and a final admonition: “Therefore choose life.” Then he climbs to the mountain peak, looks over the land promised the Jews, and dies. The full range of meaning and feeling in the old tale of work transcending death is what makes King’s reworking so powerful. This is what great speakers and teachers do: they endow their words not just with overt meaning, but with a layered wealth of story, more meaning, more stuff for their listeners to chew on. Obama in a literally mundane context turned his speech on the same idea. He’s a great speaker in the same vein as King, not because he can deliver a line well, but because the speeches he writes and delivers as well as he does have both sound and meaning — a very carefully constructed web of references and connections to other stories we have told each other. The Preacher from Georgia was a great way to frame the memory of Dr. King, that is, IMHO, not because in anonymized him, making him safe for white America — King is too strong a figure to be overtaken by his epithet, and Obama knows it. Rather the trope works because it demands we pay attention to the full meaning of both King’s words and Obama’s. In other words, what a great speech, for what it said, for what it demands of its listeners, (all 40 million of us) and what it requires we remember. 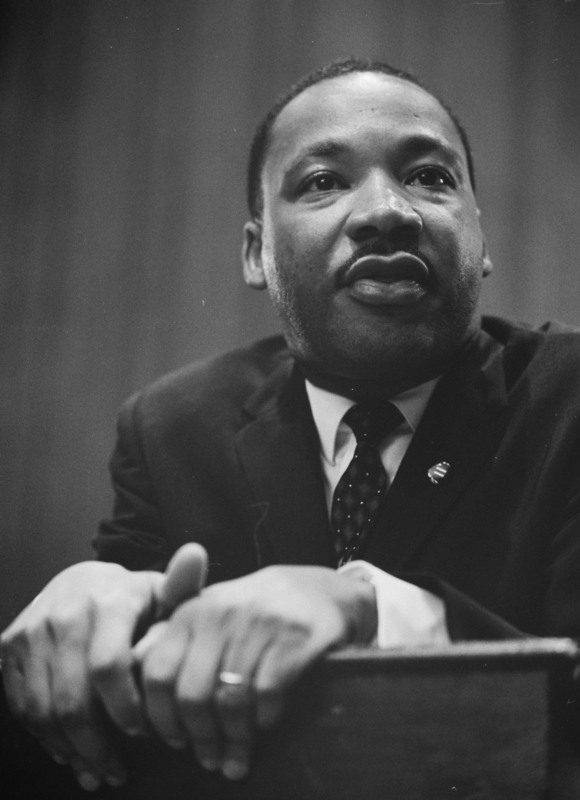 More on Martin: a man much greater than his faults. In a comment to my last post on Martin Luther King, Abel Pharmboy of the blog Terra Sigillata writes that a commenter on his blog claimed that King plagiarized the quote Abel and I both cited from Rabbi Hillel Silver, a major figure in the American rabbinate for several decades. That commenter, Right Wing Professor Gerard Harbison is correct, a little — and misleading to the point of deception at the same time. (Don’t blame me if his epithet looks like a political gibe. That’s his self-styling). Harbison links to John Lerwill’s blog to provide the original Rabbi Silver material. Lerwill’s post produces a 724 word redaction of an eight page passage in Silver’s book. Without the original book in front of me (at about 0 degrees wind chill where I sit, I ain’t heading out to the library right now) I’m going to estimate that would have been about a 3,000 word passage, maybe more. Harbison then reduced that 724 excerpt to 66 words, without any indication of how radical his surgery had been, nor where the cuts and lacunae fell. Why that kind of undocumented editing? Because the King quote is 64 words long — and by cherry-picking the original, Harbison was able to make it look like King had performed a straight rip-off, the kind that pretty much always gets an F on a paper when an undergraduate pulls that kind of stunt. In fact, even with the 724 word version, King’s treatment of Hillel’s is much more a gloss than a straight rip-off. That can be a distinction without a huge difference I suppose, but it is clearly not what Harbison implied King had done. King skipped all that part (and this kind of stuff is scattered through the Lerwill version). Instead, he focused on what he presumably felt was the nub of the issue: that science and religion have important points of connection. That’s arguable too — and certainly, plenty of folks in the science blogging community find the notion anathema. But King did not follow Silver down the road of intellectual apartheid, an agreement to reserve certain matters for the exclusive authority of one side or other. In music there is an old notion (now legally enshrined, I believe) that a repetition of more than a few notes of a passage is an actual act of imitation. Less than that, and it is presumed that there is a kind of musical langauge that everyone gets to speak. Maybe the four word phrase “Science investigates; religion interprets” crosses the line. But King had his own mind, and said something quite different than did the source of at least some of his expression. Should he have come up with some other formulation, or else acknowledged Rabbi Silver. Perhaps — probably even. But Harbison’s is a hatchet job — almost literally, given the work he did to cut and paste his alleged proof-text. Why he felt compelled to do so I won’t speculate, at least not in print. That King had his flaws is well known now, in part thanks to J. Edgar Hoover’s wiretaps. But I’d say that Martin Luther King, Jr. did pretty good in this world, whatever his sins, and he certainly paid the price for acting “with firmness in the right, as God gives us to see the right” as he strove to finish his work. Given a choice of a companion in a foxhole in armed or moral combat between King and his critics, I know who I would want by my side. Update: Link added (with apologies for the original omission) to Abel’s post on Terra Sigillata that got this response going, and to correct a couple of typos. 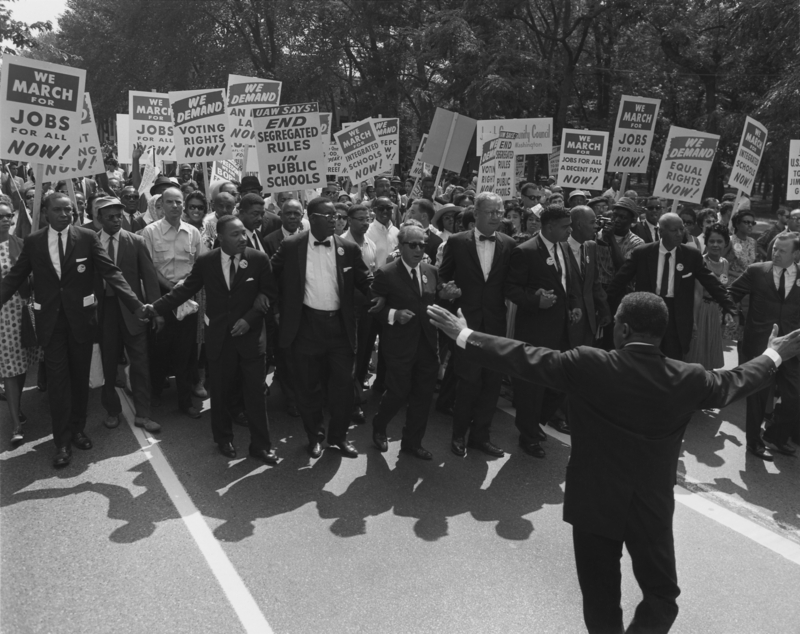 Image: King in the front rank of the 1963 March on Washington. United States Information Agency photograph of the March on Washington, (National archive number 80-G-413998). Pictured with MLK, are civil rights and union leaders, including Joseph L. Rauh Jr., Whitney Young, Roy Wilkins, A. Philip Randolph, and Walter Reuther. “Science investigates; religion interprets. Science gives man knowledge which is power; religion gives man wisdom which is control. Science deals mainly with facts; religion deals mainly with values. The two are not rivals. They are complementary. There is a well developed critique of this vision of a symbiotic relationship between science and religion, of course. For a good starting point, see Harvard philosopher Hilary Putnam’s take on the fact – value question in his Reason, Truth and History. Then have fun touring the blogosphere till your fingers bleed. But MLK is right on a key point: Science does an enormous service for those who have committed themselves to a religious life . By extension: how helpful is it for those of us who do find in science both beauty and value to talk about that experience in ways that push away the Martin Luther Kings of the world? That’s not to exclude the necessity of criticism of course. My starting point, to be developed in a later post, is the obvious one. Science does indeed deal in values, which produce a strong ethical frame. That would be primarily a professional ethic, a morality focused on the practice of science, as opposed to an all encompassing code. But I think that’s its virtue, not a flaw, because I’m a works-not-faith kind of guy. Practical ethics, a value system that shapes behavior in the real world, breeds its teaching into the bone, and not just the brain of daily, individual human experience. Update: Abel Pharmboy, commenting below, posted exactly the same first quote and photo that you see above. Whether or not that confers greatness on the two minds thus synchronized should best be left to the readers’ judgment, I suppose. Image: United States Library of Congress’s Prints and Photographs Division under the digital ID ppmsc.01269.